NAUGATUCK — Male borough police officers are hairier than normal this time of the year, and it’s for a very good cause. 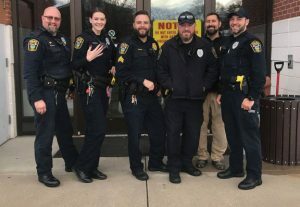 Naugatuck is one of 40 police departments in the state participating in No Shave November, a fundraiser for the Connecticut Cancer Foundation that involves officers not shaving their facial hair. Each officer who lets their facial hair grow donates at least $50 to the foundation. So far, Naugatuck officers have raised about $2,150, according Lt. Colin McAllister, president of the Naugatuck Police Union. Burns said the money will go toward expenses for cancer patients, including unreimbursed co-pays, transportation to medical visits and basic living expenses, such as rent, mortgage and utility payments. Some of the money will also go to cancer research, Burns said. No Shave November will especially help 15-year-old Wes, the foundation’s No Shave November Ambassador. Wes is battling metastatic Ewing’s sarcoma, and his family will receive a large grant based on what is raised. The rest of the money will go to cancer patients in Connecticut throughout the year. Burns said each male officer who want to let their facial hair grow for the month of November and December must donate at least $50, and seven female Naugatuck officers have permission to wear colorful nail polish and designs for these two months if they donate. Typically female officers aren’t allowed to wear colorful polish or designs on their fingernails, Burns said. The Connecticut Cancer Foundation is a nonprofit organization whose mission is to financially help Connecticut cancer patients and fund cancer research. Their goal is to help as many Connecticut cancer patients as possible, and over the past 31 years they have provided $5 million in financial aid to state cancer patients and their families. The foundation’s initial goal was $50,000 but after they reached that goal on Nov. 8, they increased the goal to $80,000. On Wednesday, they surpassed that goal and are now at $82,325. McAllister said officers enjoyed taking part in the fundraiser. This event follows Naugatuck police department’s “Get Your Pink On!” fundraiser in October where officers wore pink Naugatuck Police patches to raise money for breast cancer awareness month.